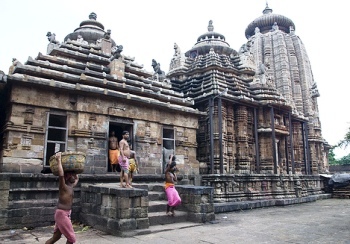 Ananta Vasudeva Temple is a Hindu temple dedicated to Lord Krishna, an avatar of Lord Vishnu located in Bhubaneswar, the state capital of Odisha, India.The temple was constructed in the thirteenth century, and the complete murties of Krishna, Balarama and Subhadra are worshipped there. Balarama stands under a seven hooded serpent, Subhadra holds Jewels pot and lotus in her two hands keping her left foot over another jewel pot, while Krishna holds a mace, chakra, lotus and a conch. The temple dates back to the period of Chandrika Devi, the daughter of Anangabhima III, during the reign of the king Bhanudeva.